This Statement of Rights and Responsibilities ("Statement," "Terms") derives from the ELEX Principles, and is our terms of service that governs our relationship with users and others who interact with ELEX, as well as ELEX brands, products and services, which we call the “ELEX Services” or “Services”. By using or accessing the ELEX Services, you agree to this Statement, as updated from time to time. Additionally, you will find resources at the end of this document that help you understand how ELEX works. Because ELEX provides a wide range of Services, we may ask you to review and accept supplemental terms. To the extent those supplemental terms conflict with this Terms, the supplemental terms associated with the app, product, or service govern with respect to your use of such app, product or service to the extent of the conflict. These Terms of Service (“Terms”) are a legal agreement between Beijing ELEX Technology CO., Ltd. (“Elex” or “we”) and you (“you”). By using or accessing any Elex game or application (“Service”) you agree to be bound by these Terms. By accessing or using the Service, you agree that you have read, understood, and accept to be bound by the Terms. Elex reserves the right, in its sole discretion, modify or revise these Terms at any time, and you agree to be bound by such modifications or revisions. If you violate the Terms, Elex reserves the right to issue you a warning regarding the violation or immediately terminate or suspend any or all accounts you have created using the Service. You agree that Elex need not provide you notice before terminating or suspending your account(s), but it may do so. Elex reserves the right to refuse any user access to the Services without notice for any reason, including, but not limited to, a violation of the Terms. You agree that Elex may discontinue the Service or change the content of the Service at any time, for any reason, with or without notice to you, without liability. ELEX suggests that minors shall not access internet without prior written consent of their parents or other legal guardians. Intellectual Property/Ownership All materials that are part of the Service (including, but not limited to, designs, text, graphics, pictures, video, information, applications, software, music, sound and other files, and their selection and arrangement) are protected by law from unauthorized use. The entire contents of the Service are copyrighted under the United States copyright laws and/or similar laws of other jurisdictions. You agree that no materials that are part of the Service may be modified, copied, distributed, framed, reproduced, republished, downloaded, scraped, displayed, posted, transmitted, or sold in any form or by any means, in whole or in part, or otherwise exploited without ELEX’s express prior written permission, except that the foregoing does not apply to your own User Content (as defined below) that you legally post on the Site. All other uses of copyrighted material, including any derivative use, requires express prior written permission from ELEX. Any reproduction or redistribution of materials not in accordance with these Terms is expressly prohibited and may result in severe civil and criminal penalties. Elex and/or its licensors remain the owners of right, title, and interest, including copyrights and other intellectual property rights, in and to all materials posted on the Services by Elex. You acknowledge that you do not acquire any ownership rights by using the Service or by accessing any materials posted on the Service by Elex, or any derivative works thereof. Elex grants you a personal, non-exclusive, non-transferable, revocable, limited scope license to use the Service solely for the purpose of viewing and using the applicable Services and for no other purpose whatsoever. Your license to use the Services is limited by these Terms. You agree that you are willingly publishing the content on the Service using technology and tools provided by Elex. You understand and agree that you may not distribute, sell, transfer or license this content and/or application in any manner, in any country, or on any social network or other medium without the explicit written permission of Elex. You grant Elex the right to act as an agent on your behalf as operator of the application. Any data, text, graphics, photographs and their selection and arrangement, (hereinafter “User Content”) uploaded to the Service are subject, whether in whole or in part, to unlimited commercial, non-commercial and/or promotional use by Elex. Text, graphics, and photographs are uploaded by you and are the sole responsibility of the person from whom the User Content originated. Thus, users are responsible, and Elex is not responsible for any files users upload, post, or otherwise make available. Elex may or may not regulate User Content and does not guarantee the accuracy, quality, or integrity of any User Content posted via the Elex application. By using Elex you acknowledge and accept that you may be exposed to material you find offensive or objectionable. You agree that Elex will not under any circumstances be liable for any User Content, including, but not limited to, errors in any User Content, or any loss or damage incurred by use of the User Content. Elex reserves the right to remove and permanently delete any User Content from the Service with or without notice. Property of Service consists of those materials provided to you such as virtual assets, achievements and other resources. You understand that while at times you may earn, buy or purchase Property of Service; you do not in fact own or have any property interest in the Property of Service and the price of any Property of Service does not refer to any credit balance of real currency or its equivalent. Elex does not guarantee that any particular product or Property of Service will be available at all times or at any given time or that Elex will continue to offer the product or Property of Service for any particular length of time. Elex may change, manage, control and/or update Property of Service or change the price of Property of Service without notice to you. Elex does not recognize the transfer of accounts or Property of Service. You may not purchase, sell, resell, lend, rent, gift, trade or otherwise transfer any account or Property of Service, or offer to purchase, sell, resell, lend, rent, gift, trade or otherwise transfer any account, Property of Service or materials, and any such attempt shall be null and void. You may apply for refund when the Property of Service is not received in your account after your purchase. You may contact our customer service via link in game, or send us an email at aoe2_help@elex.com. The Elex Service may provide communication channels such as forums, communities, or chat areas (“Communication Channels”) designed to enable you to communicate with other Service users. Elex has no obligation to monitor these communication channels but it may do so and reserves the right to review materials posted to the Communication Channels and to remove any materials, at any time, with or without notice for any reason, at its sole discretion. Elex may also terminate or suspend your access to any Communication Channels at any time, without notice, for any reason. You acknowledge that chats, postings, or materials posted by users on the Communication Channels are neither endorsed nor controlled by Elex, and these communications should not be considered reviewed or approved by Elex. Elex will not under any circumstances by liable for any activity within Communication Channels. You agree that all your communications with the Communication Channels are public, and thus you have no expectation of privacy regarding your use of the Communication Channels. Elex is not responsible for information that you choose to share on the Communication Channels, or for the actions of other users. Agreements exploit, distribute or publicly inform other members of any game error, miscue or bug which gives an unintended advantage violate any applicable laws or regulations, or promote or encourage any illegal activity including, but not limited to, hacking, cracking or distribution of counterfeit software, or cheats or hacks for the Service Disclaimer of Warranty; Limitation of Liability You agree that your use of the Service shall be at your sole risk. To the fullest extent permitted by law, Elex, its officers, directors, employees, and agents disclaim all warranties, express or implies, in connection with the website and your use thereof including implied warranties of title, merchantability, fitness for a particular purpose or non-infringement, accuracy, authority, completeness, usefulness, and timeliness. Elex makes no warranties or representations about the accuracy or completeness of the content of the Service of the content of any sites linked to the Service and assumes no liability or responsibility for any (i) errors, mistakes, or inaccuracies of content, (ii) personal injury or property damage, of any nature whatsoever, resulting from your access to and use of the Service, (iii) any unauthorized access to or use of our secure servers and/or any and all personal information and/or financial information stored therein, (iv) any interruption or cessation of transmission to or from the Service, (v) any bugs, viruses, trojan horses, or the like which may be transmitted to or through the Service by any third party, and/or (vi) any errors or omissions in any content or for any loss or damage of any kind incurred as a result of the use of any content posted, emailed, transmitted, or otherwise made available via the Service. In no event will Elex, its directors, officers, agents, contractors, partners and employees, be liable to you or any third person for any special, direct, indirect, incidental, special, punitive, or consequential damages whatsoever including any lost profits or lost data arising from your use of the Service or other materials on, accessed through or downloaded from the Service, whether based on warranty, contract, tort, or any other legal theory, and whether or not Elex has been advised of the possibility of these damages. The foregoing limitation of liability shall apply to the fullest extent permitted by law in the applicable jurisdiction. You specifically acknowledge that Elex shall not be liable for user submissions or the defamatory, offensive, or illegal conduct of any third party and that the risk of harm or damage from the foregoing rests entirely with you. You agree to indemnify and hold Elex, and each of its directors, officers, agents, contractors, partners and employees, harmless from and against any loss, liability, claim, demand, damages, costs and expenses, including reasonable attorney’s fees, arising out of or in connection with (i) your use of and access to the Service; (ii) your violation of any term of these Terms of Service; (iii) your violation of any third party right, including without limitation any copyright, property, or privacy right; (iv) any claim that one of your User Submissions caused damage to a third party; or (v) any Content you post or share on or through the Service. General By visiting or using the the Service, you agree that the laws of The People’s Republic of China, without regard to principles of conflict of laws and regardless of your location, will govern these Terms of Service and any dispute of any sort that might arise between you and Elex. 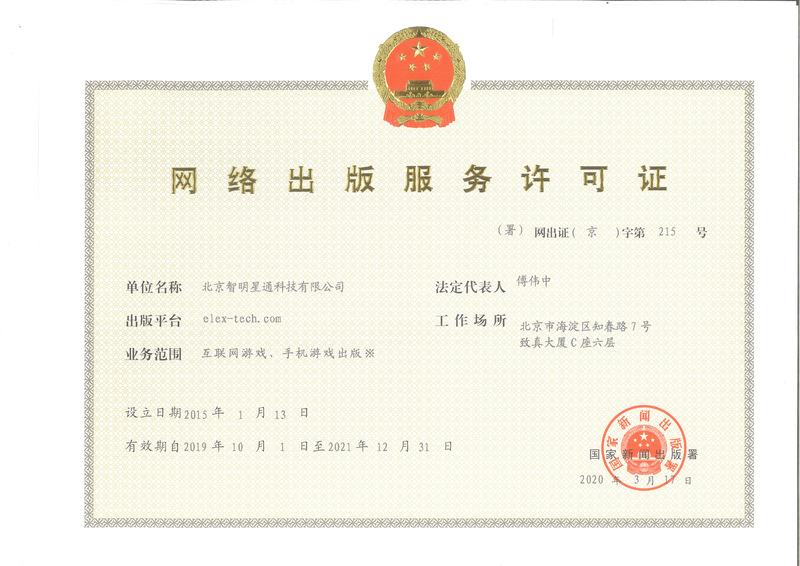 Any claim or dispute between you and Elex that arises in whole or in part from your use of the Service shall be decided exclusively by a court of competent jurisdiction located in Haidian District，Beijing , and you hereby consent to, and waive all defenses of lack of personal jurisdiction and forum non conveniens with respect to venue and jurisdiction in Beijing. Elex reserves the right to amend these Terms of Service at any time and without notice, and it is your responsibility to review these Terms of Service for any changes. Your use of Elex following any amendment of these Terms of Service will signify your assent to and acceptance of its revised terms. YOU AND ELEX AGREE THAT ANY CAUSE OF ACTION ARISING OUT OF OR RELATED TO THE SERVICE MUST COMMENCE WITHIN ONE (1) YEAR AFTER THE CAUSE OF ACTION ACCRUES. OTHERWISE, SUCH CAUSE OF ACTION IS PERMANENTLY BARRED. The right to use the account belongs to the initial procures only, except in ELEX sole discretion. Please notice that ELEX prohibits giving, assigning, transferring, inheriting or selling accounts for any reason in any form. ELEX reserves the right, without prior notice, to reclaim accounts that are operated by non-initial applicants. ELEX will not assume any responsibility, obligation, or liability for communication interruption, loss of personal data and game items, login failure and any other losses to any non-initial procures.